Valid till the end of March only. other services on top of this package with 50% discount. Dusting, windows, floors, general bathroom cleaning, Kitchen (tiles,floor and dusting) Services needed on top of this package can be booked with 50% discount. 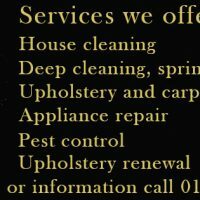 To book your spring clean call: [Details removed by SW] .